This morning, Universal Orlando Resort officially opened The Wizarding World of Harry Potter – Diagon Alley at Universal Studios Florida. 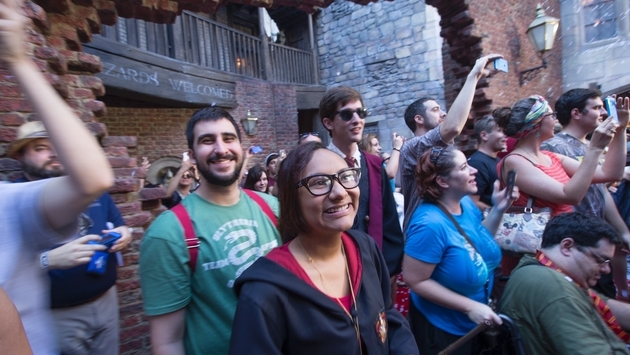 Confetti, fireworks and a red carpet lined with dozens of cheering Diagon Alley team members welcomed thousands of excited guests as they entered the all-new spectacularly-themed land for the very first time. The Wizarding World of Harry Potter – Diagon Alley brings even more of Harry Potter’s adventures to life at Universal Orlando Resort. This fully-immersive area expands upon the global phenomenon launched by Universal Orlando when it opened The Wizarding World of Harry Potter – Hogsmeade at Islands of Adventure in 2010. The Wizarding World of Harry Potter - Diagon Alley is filled with incredible entertainment experiences for the whole family. You arrive aboard the Hogwarts Express, which takes guests on a journey between the two lands of The Wizarding World of Harry Potter, and are transported into a spectacularly themed environment. The new area includes incredible shops with windows full of magical surprises, authentic food and beverages, a towering dragon that breathes fire and Harry Potter and the Escape from Gringotts, a new attraction unlike any other that takes you on a mind-blowing ride through the Gringotts vaults – pulling you into an incredible adventure. More details about The Wizarding World of Harry Potter – Diagon Alley and available vacation packages can be found at www.UniversalOrlando.com/wizardingworld.